hunters | Chronicles of a "Mini-Pro"
Clinicians that have trained and competed at the elite levels in multiple disciplines, have a depth of knowledge and experience that is the accumulated wisdom from countless types of horse and mentors. Bernie Traurig, founder of www.equestriancoach.com, is just such a clinician, and he has made it his mission to give back to equestrian sport by improving access to top notch instruction, exercises and lessons. Traurig recently gave a three day jumping clinic at Ridgeway Stables in Dover, NH, where he engaged auditors, riders and even his ring crew with tips, theory, questions and feedback. Regardless of the level of horse or rider, Traurig’s advice and instruction centered on the importance of correct basics, equine responsiveness to appropriately applied aids, selecting the best equipment for the job and of course, always thinking like a horseman. Here are five of the recurring themes Traurig emphasized throughout sessions which ranged from 2’9” to 3’6”. In fact, Traurig travels with a ‘bit bag’ and made frequent adjustments throughout the weekend to many horses’ equipment. Every change was made on an experimental basis, with a willingness to adjust again if the change wasn’t working. “You should fix your position flaws not because of ‘good equitation’ but for correct basics,” said Traurig. Traurig gave riders well balanced feedback, quick to offer praise even when some elements of an exercise went wrong. In particular, he helped the riders to learn to feel when their positions were hindering their ride. “The goal in the walk is to have elastic arms, allowing the horse to accept a soft feel and reach long over their backs,” said Traurig. Several riders struggled at first to find the right balance between holding the reins too much or not enough, and Traurig helped them to find the middle ground. Even experienced riders can benefit from position checks. On day two, Traurig challenged the most advanced riders to warm up without their irons in the counter canter. He then had them raise their outside arm above their head, then drop the arm to hang behind their knee, all while maintaining the counter canter. After returning to sitting trot, the riders were told to use their inside hand to grab the pommel to really pull their seat down. Finally, they were asked to post without their irons for ten feet, then hold two point for ten feet, continuing this around the arena. A lot of becoming an effective rider is about knowing what to do and when, in just the right amount. To achieve this end requires hours of practice; but as we all know, only correct practice will build the long term responses we want in horse and rider. To be a truly excellent horseman, the rider must always pay attention to the smallest elements of precision, whether it is in terms of care, tack adjustment, or ridden performance. Traurig’s sharp eye missed no detail and gave all participants a sense of the type of attention required. For one example, he reminded everyone that spurs must be worn on the spur rest, or else it is not possible for the rider to apply their leg without using the spur. In another correction, Traurig told riders that they must be precise with the timing for the flying change. “Do not do the change on a curved line,” coached Traurig. “Hold them straight. There are three fundamentals to riding a good change. First, you need impulsion which you can balance, straightness produced by holding the line with an opening rein on the outside, and the correct timing and intensity of the leg aid, which is determined by who you are riding. If the horse is hot or sensitive, you may have to stay in half seat to help them stay quiet. If a horse has not yet learned the flying change, and especially when there is little room on the recovery side of a fence, riders should plan to trot at the corner no matter what. “It is better to do this than to allow the horse to start swapping in front without changing behind,” said Traurig. Traurig told riders that for any line which requires a turn, the best technique is to look for the approach to the second fence first, then back up the line to where you have to make the turn from. “Whenever you don’t see [a distance], stay out further and shorten the stride a little to buy some time,” said Traurig. Finally, Traurig reminded riders that every horse has their own “right” canter, a speed at which they jump the best out of. “You can jump any course in the world with good track control and the ability to adjust the length of stride,” said Traurig. Traurig is an attentive and enthusiastic educator, passionate about communicating with all present the fundamental basics which underlay any successful equestrian performance. Blending a commitment to correct basics with his precise ability to customize exercises and tools to suit each unique pair, Traurig is a master at giving riders the information they need to know, right when they need to hear it. Traurig’s final piece of advice? “The most important part of your body when you ride is your brain,” said Traurig. This blog was previously posted on Horse Network. Thanks for sharing! Schooling and Riding the Sport Horse was originally given to me to review for possible use as a text in a course I teach at the University of New Hampshire. I had high hopes for the book, as author Paul Cronin is a well-respected protégé of the late Vladimir Littauer and also the longtime director at Sweet Briar College’s riding program. The content of the book is geared towards the riding and training of hunter/jumpers and is well organized. Unfortunately, it is also dry and dense, with dated images, and will simply not be read by the Millennials I am now responsible for educating. If you tell me that you have a Millennial-aged student who will actually read this book….I frankly don’t believe you. I started reading Schooling and Riding the Sport Horse back in 2014. I finished it late in 2016. I was stubborn and determined to get through it. It is simply not a page turner. 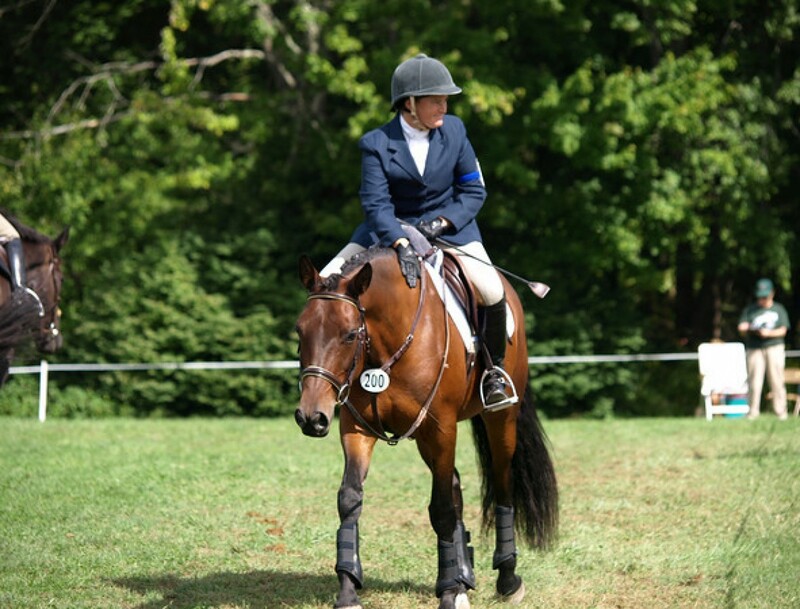 As a rider/trainer whose interests tend more towards dressage and eventing, I still find a great deal of helpful inspiration in understanding the training systems used by those who are more oriented towards hunters, equitation and jumpers. In this book, I do think that Cronin clearly and progressively lays out the elements of his system, which is geared to develop the position, controls and schooling of the horse used in forward seat riding. But starting as early as the introduction, I started to take issue with what I perceived as his derogatory tone towards the classical dressage system and his belief in the superiority of what he calls the “American hunter seat”. I think I had a hard time letting go of this perceived slight throughout the rest of the book. Author Paul Cronin in an uncredited photo. With that being said, I found much to agree with in the book as well. I appreciated his emphasis on the importance of correct and progressive work on the flat to prepare horse and rider for over fences performance. For example, Cronin points out that “it is not accurate to refer to the short gaits with hunters as classical collected gaits. That is a concept that has a special meaning in educated classical dressage riding. The hunters are not collected and on the bit but are connected and on soft contact” (Cronin, 2004, p. 33). This sentence is contained in his chapter on “Position and Controls”, in which he details some of the differences in theory and objective between what I would call classical dressage theory and American hunter seat theory. Captain Vladimir Littaur was an influential early proponent of forward seat riding. His book, “Commonsense Horsemanship” was a bible for the discipline for many years. Another theme in the book which I appreciated was Cronin’s direct acknowledgement that all horses and riders have their “niche”; not every horse needs to be trained to the highest levels, because not every rider aspires to ride to them. “Not all horses and riders will be able to achieve the advanced level of control not do they need to in order to experience safe, enjoyable riding” (Cronin, 2004, p. 46). He further expands this concept in other chapters, including “Evaluating and Selecting a Horse” and “The Philosophy for Schooling in the Modern Hunter/Jumper System”. The last half or so of the book is the description of a systematic and progressive series of “schooling periods” which takes the horse successively through seven stages of training. Each phase includes key concepts and exercises to be attained during the schooling period, important concepts to keep in mind and pitfalls to watch for, as well as some sample plans for workouts and training sessions. The most important theme is “systematic progression”. Each step is to be taken in turn, not sooner, not later. A serious trainer could absolutely use this series to develop a young horse or retrain one who had inconsistencies in previous work. My sentiments towards this book softened as I read through the chapters on the schooling periods. It is clear to me that Cronin is a classical trainer in the style of American forward seat riding, and believes firmly in consistency, patience and slow, steady, horse-oriented progress. I was able to draw more connections between his concepts and those common to the training of dressage and eventing horses in these chapters than the others (mind you, this was all in year three of reading the book). Overall, this book really is a good source of information, even if it is written in an “old school” style which makes it a bit dense. For a reader who is able to thoughtfully digest any of the classical texts on horsemanship written by the old masters, this book would certainly ring true and fit right into that library. Unfortunately, for the average modern reader of horsemanship books, I am afraid the terminology used throughout the book is too uncommon, the text too dry, and the photos too dated to make it a useful reference. I suspect that most ambitious modern riders who purchased this book have left it sitting on their shelves amongst the others which they have never quite made it around to reading. If you are looking for an easy read on progressive horsemanship—this isn’t your book. If you want to delve into a systematic progression for the training of hunters and jumpers, and enjoy really taking the time to understand the heritage left by Littauer (who went on to influence so many of the great American horsemen of the 20th century), then this text may be worth the time to plod through.